This article was written by Jon Reidel and originally appeared at UVM.edu. 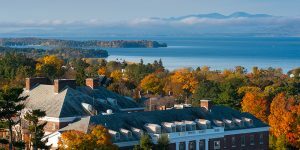 That dream became reality on Oct. 31 when The Princeton Review ranked the University of Vermont Grossman School of Business’ Sustainable Innovation MBA program No. 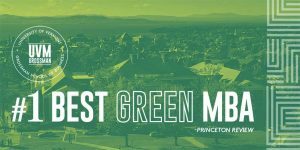 1 on its 2018 list of “Best Green MBA” programs. UVM took over the top spot from the University of Oregon, which dropped to No. 4 behind second-place Yale and Portland State, followed by No. 5 Stanford. The decision to replace a traditional 38-year-old MBA program with the nation’s first one-year AACSB-accredited MBA focused entirely on sustainable innovation seemed risky, but according to Sharma, was perfect timing. A growing demand by companies seeking managers to convert global sustainability challenges into business opportunities for triple bottom line performance – a measure of a company’s financial, social and environmental impact – was undeniable. 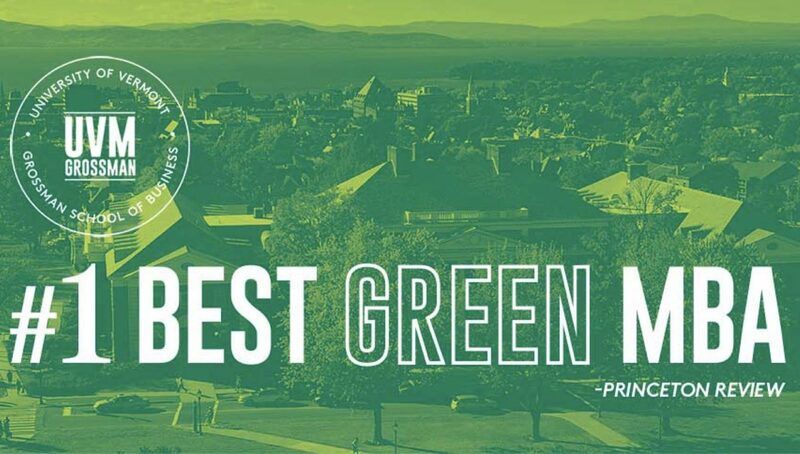 The “Best Green MBA” rankings are based on students’ assessments of how well their school is preparing them in environmental/sustainability and social responsibility issues, and for a career in a green job market. The Grossman School of Business’ Sustainable Innovation MBA was also included in The Princeton Review’s list of the 267 Outstanding On-Campus MBA programs. This list was based on data from surveys of 23,000 students attending the schools and of administrators at the graduate schools. Worldwide practicums with top companies, access to exclusive job network set program apart. 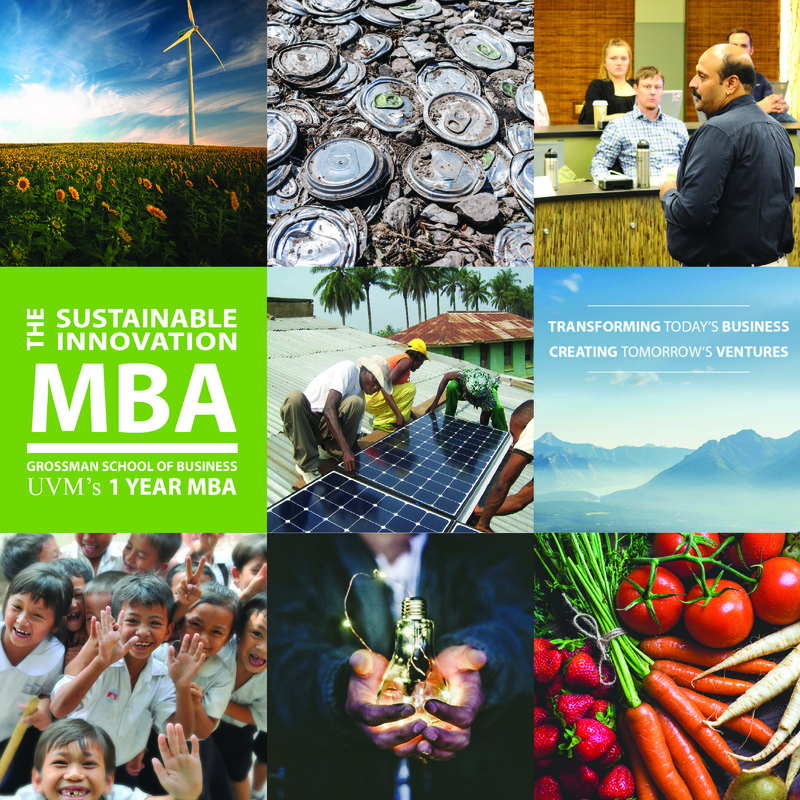 A number of aspects of UVM’s Sustainable Innovation MBA set it apart from other programs. The course curriculum, based entirely on sustainability and innovation, is delivered by world class faculty in this arena under four modules: foundations of management; building a sustainable enterprise; growing a sustainable enterprise; and focusing on sustainability. Following coursework, students engage in a three-month practicum – a capstone experiential project to address issues such as poverty, climate change, and the environment – with companies like PepsiCo, 1% For the Planet, Philips, Ingersoll Rand, Burton, Keurig, and Facebook. Students traveled to India, Mexico, Ghana, Brazil, Denmark, China, Kenya, and Guatemala to complete practicums, which have led to sustainability and innovation-related jobs at Ben & Jerry’s, King Arthur Flour, Pottery Barn, Seventh Generation and others. Students also have access to a new career management system called “Launch” designed to propel them into careers in renewable energy, clean tech, affordable health care, inclusive business, entrepreneurship within larger companies, start-ups, and other innovative ventures. The program’s Changemaker Network, composed of more than 125 companies and individuals focused on sustainable business, puts students in direct contact with mentors who help them land jobs within the program’s condensed 12-month format. The Princeton Review ranking comes on the heels of a No. 8 ranking by Corporate Knights – a Toronto-based media and research company focused on clean capitalism – in its “Better World MBA Rankings.” The UVM program moved up two spots from last year and is now ranked third among U.S. schools, trailing only Duquesne University and MIT’s Sloan School of Management. Corporate Knights ranks programs based on the number of core courses, institutes and centers, and faculty research produced in the last three years related to sustainability, including corporate responsibility, human rights, and ethics.